Captain Gary Torgerson of the Colorado State Patrol and James Holahan examine the fortified bulldozer driven by Marvin Heemeyer where it came to rest at in Granby, Colorado. After his zoning petition was dismissed, Marvin Heemeyer decided to modify his bulldozer and get revenge on the town that wronged him. When Marvin Heemeyer of Gramby, Colorado, reached a dead end in his fight with the zoning commission, the logical response would have been to petition them again and await a future response. After all, Marvin Heemeyer was said to be a logical man, so it makes sense that he would take a logical approach. Inside the killdozer made by Marvin Heemeyer. Marvin Heemeyer’s fight with the city had begun three years before his killdozer rampage. Heemeyer owned a small welding shop in town, where he made his living repairing mufflers. He’d purchased the land on which his shop was built in 1992, and over the years had agreed to sell the land to a concrete company to build a plant. The negotiations hadn’t been easy, and he’d been having trouble agreeing with the company on a suitable price. In 2001, the city approved construction of a concrete plant, zoning the land next to Heemeyer’s for the use. Heemeyer was furious, as he’d used the land for the past nine years as a shortcut between his home and his muffler shop. He petitioned the city to have the property rezoned to prevent the construction of the plant, but was rejected on multiple occasions. So, in early 2003, Marvin Heemeyer decided he had enough. A few years earlier, he purchased a bulldozer with the intent to use it to create an alternative route to his muffler shop. Now, however, it would serve a new purpose as his weapon of mass destruction, the killdozer. 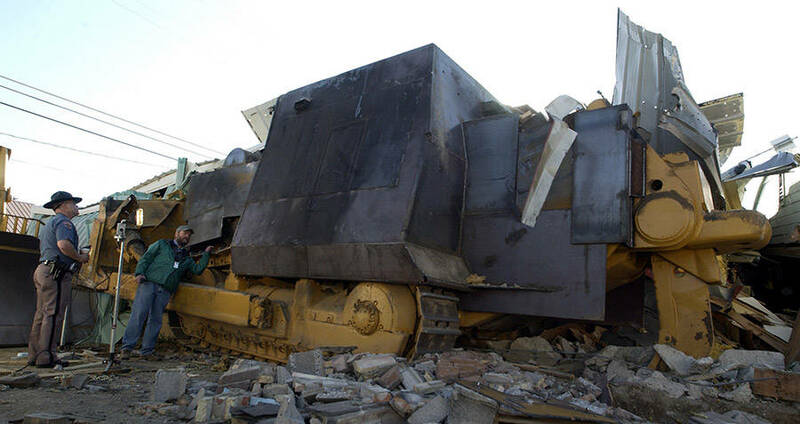 Marvin Heemeyer’s killdozer taking out a building. He began outfitting his bulldozer with armored plates, covering the cabin, engine, and parts of the tracks. He’d created the armor himself, using a concrete mix poured between sheets of steel, sometimes creating plates over a foot thick. In the end, the killdozer was resistant to small arms fire and resistant to explosives – and indeed, the rounds fired at it during the rampage had no ill effect. As the armor covered much of the cabin, a video camera was mounted on the exterior for visibility, covered by 3-inch bulletproof plastic. Inside the makeshift cockpit were two monitors on which Heemeyer could observe his destruction. There were also fans and an air conditioner to keep him cool while he pummeled the town. Finally, he fashioned three gun ports and outfitted them with a .50 caliber rifle, a .308 semi-automatic, and a .22 long rifle. According to authorities, once he’d sealed himself inside the cockpit, it would be impossible to get out – and they don’t believe he ever wanted to. When his killdozer was finished almost a year and a half after Heemeyer began assembling it, he readied himself for his attack. 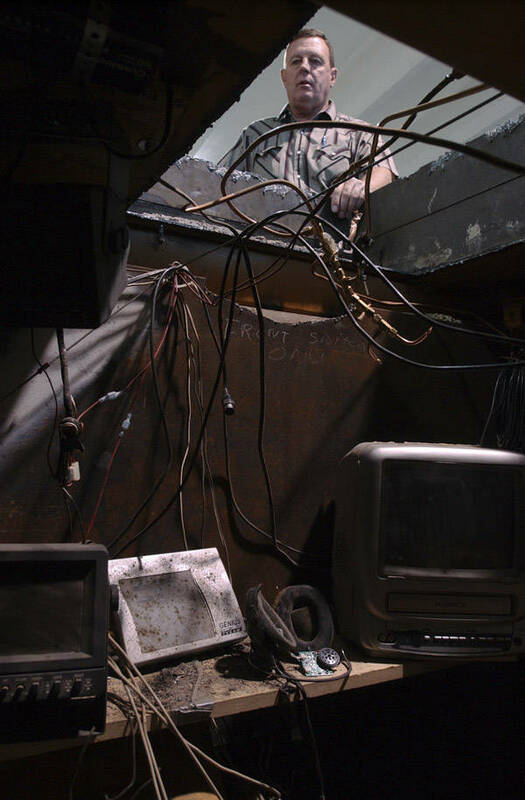 On June 4, 2004, he sealed himself inside of his killdozer’s cockpit and set out for the town. He drove the machine out of his shop through the wall, then plowed through the concrete plant, the Town Hall, a newspaper office, a former judge’s widow’s home, a hardware store, and other homes. Authorities realized that every business or home that had been bulldozed had some connection to Heemeyer and his plight against the zoning committee. For two hours and seven minutes, Marvin Heemeyer and his killdozer rampaged through the town, damaging 13 buildings and knocking out gas services to City Hall. Such a panic was caused that the governor considered authorizing the National Guard to attack with Apache helicopters and an anti-tank missile. The attacks were even in place and had Heemeyer not wedged himself in the basement of a hardware store on his own, they would have been carried out. 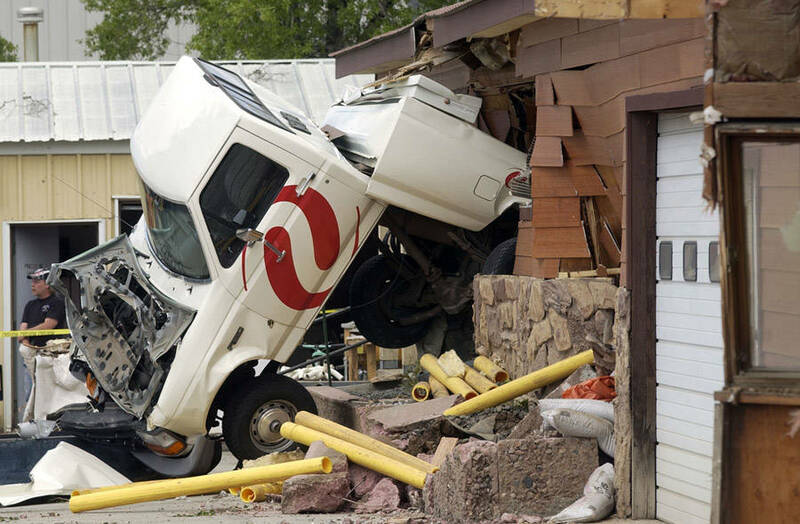 A destroyed Xcel energy truck is stuck into the Mountain Parks Electric building as a result of Marvin Heemeyer’s rampage with an armored bulldozer. As he attempted to bulldoze Gambles hardware store, he got the killdozer stuck in the foundation. With the end in sight, Heemeyer killed himself with a shotgun in his cockpit, determined to leave the world on his own terms. Despite the nearly $7 million in property damage done to the town of Gramby, not a single human besides Heemeyer was killed. A reverse 911 system was used to notify residents of the killdozer so that they could get out of the way in time. After the rampage, authorities searched Heemeyer’s home and found multiple notes and audio tapes that outlined Heemeyer’s motivations. They also found that several men who had visited Heemeyer’s shop where he was building the killdozer had never noticed it, a fact which encouraged Heemeyer. As for Marvin Heemeyer’s killdozer itself, state officials decided to take it apart and sell it for scrap. They sent the pieces to dozens of scrap yards to stop admirers of Heeymyers from snatching a piece, as it soon became clear that the killdozer was going to be the subject of amateur builders for years to come. Upcoming documentary ‘Tread’ will take an inside look at the man and his armored machine, which was outfitted with nearly impenetrable steel and a few automatic weapons. Next Next post: Alabama votes to keep all the plastic trash. Proving they’re still behind the times.